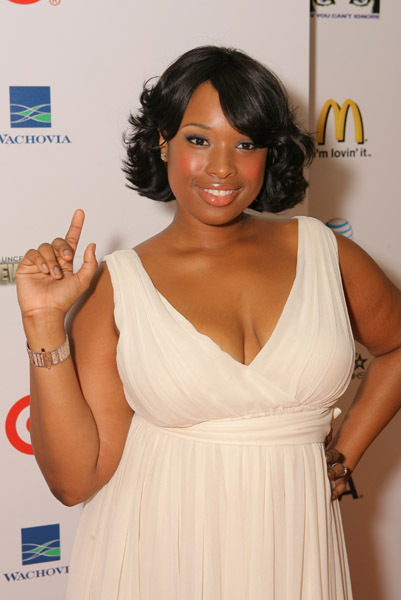 Is Jennifer Hudson's life turning into a reality show? The "American Idol" contestant just got engaged Friday night -- on her birthday -- to her boyfriend (of less than a year) David Otunga, also a reality TV star. Of sorts. You may recall David Otunga, or you may not, from his appearance last year as "Punk" in the VH1 reality show "I Love New York 2." If you watched the show, then you know that the Oscar-winning "Dreamgirls" actress is going to marry a guy who was rejected on the show by a woman named New York who was also rejected -- twice -- by Flavor Flav on his own reality love show called "Flavor of Love." Maybe Hudson knows all too well the intricate and secretly scripted play-to-the-camera aspects of reality TV. Maybe that's why she's not bothered by New York rejecting her fiance. Jen's got a lot going on in her life right now. She's engaged, has a wedding to plan, has a new album out and her new movie, "The Secret Life of Bees," is due in theaters Oct. 17. To see Jennifer's hot new fiance doing some bench presses, watch this video excerpt from "I Love New York 2." Can anyone say, "prenup?" Dude looks a little like Terry McMillan's ex. I don't think she'll need that prenup too badly. He has a Harvard Law Degree and worked for the Rainbow Push Coalition Coalition. Jennifer what happen to you boyfriend of 8 years and not getting involved with the rat race of hollywood, girl don't be no fool. go home and find James the Jaintor. I promise you will be happier in a long run. Stop following those Hollywood fools like beyonce. I think this is crazy Jennifer you have too much going on for you what happen to her childhood sweetheart.. he is just looking for a gold mine.. oh my gosh don't marry him get someone on your level not reality tv looking for a break through come on with New York,, oh gosh he is not a strong black man..
Good luck. What happen to your old boyfriend James? Jen, PRENUP PLEASE. be careful. For some reason, this guy makes me worry about you. You are a nice girl. Harvard Law School? I don't think so. I don't know why you and your ex broke up,I was wondering were you singing about him in your last song. I hope you made a wise decision. You are young don't move too quick. Think about it, why would you want to marry a man that wanted New York. You are better than that. Don't lower your standards young lady. Do your research first he looks like a woman. I understand you and your ex may not be working out but slow down. He don't know you and you don't know him. Please Please don't do it, enjoy your career and some time to yourself first. I honestly do not think she will marry him...not because of his shamed reality fame or because people say he's gay or even because it very well may be that he's looking to ride her coattails to pump up (excuse the pun LOL) his own fame...but because God will intervene and show this young gifted and black woman that she needs to spend more time with a man before he can truthfully claim to love her and that the love IS REAL. I look at the episode where trashy nasty filthy New York dumped him and see how pathetically he reacted as compared to the other "Losers" who just bowed out gracefully and daresay, this fine hunk of a man is looking for fame and fortune. He may be that honorable Harvard Law School graduate, turned reality star, turned Rainbow Coalition man, but he's still a man and I think Jennifer needs to proceed with extreme caution with this guy. Oh my goodness....another one bites the dust. Jennifer please take your time. What will be will be. YOU don't know this guy, look at Beyonce and Jay she knows the real him and still choose him, not because he was good the first year. And another thing he looks to much like Terry McMillian's man. Can anyone say GAY! Nothing is wrong with being gay but at least be honest. Godspeed Sister! Is Jennifer for real? This guy looks scary! I agree with Teri B. she needs to proceed with caution, he looks unstable. Perhaps she will listen to that voice that is telling her to run once all the excitement dies down, that's my prayer anyway. Whatever she decides, I wish her the best. Jennifer I admire your rise and it is well deserved, you are talented. But, this dude is bad news I feel it. PRENUP, PRENUP, he is looking to your star or anybody's for that matter. If he wanted a tramp like New York, that should be enough to tell him to hit the road! Okay, so what the girl wants to get married,That is her business after all. Why can't ppl just wish others the best and live their own lives? Im just happy for her, she is doing what she wants to do so why dont you?! ppl always telling ppl what they need to do. Why dont you take your own advice and see what happens? Why do these women get involved with guys of questionable sexuality. I hear GAYDARS goes off for this guy! I give them six months, 1 year max. J. Hud. . One word: "Stella". People stop hating on J.Hud music and acting, yall just mad cus yall wish it happened to you. But yeah her man is strange so is his mom and sister. He do look gay wit them spikes in his head. Yeah he's a male booty snatcher. Dear Jennifer: I know it is none of my business who you marry, but just out of concern for you and knowing the devastation of a dream destroyed in a failed marriage, I pray you don't end up with your heart torn apart the way I did. No one knows better than I do the heartbreak of a failed marriage...Nobody! Please take time to know him! Even at that, you never really know a person, but when you live with him, you will learn things you wish you had known before hand; and you will also have to face things you ignored that was right there in your face, but emotions clouded your view. I think you are a sweet and wonderful girl, very, very talented, and I would not want anyone to hurt you, so please be careful. The Bible says, "In the mouth of two or three witnesses let every word be established." In other words, when more than one person is saying the same thing, Jennifer, you should pay attention! There are a lot of warnings, so just don't ignore them. And please get an airtight pre-nup! Love you lots, Earlene, somebody that knows! isn't her fiance the guy from I Love New York 2? Jennifer, I hope that u actually read these comments bec. u need to slow down and u need some serious guidance. TAKE UR TIME!. Nothing against the new guy, but your old boyfriend was probably with u through thick/thin. Maybe he was having a hard time adjusting to your quick rise to fame and living in YOUR spotlight. If you truly ever loved the guy then try to reassure him. If no success, then move on, but move on cautiously and take your time to get to know a person. Remember, your old boyfriend was with u when you were climbing the ladder of fame. Don't be another statistic. Are u telling me you can't work out ur problems?, or is it that u have gotten so caught up into the hollywood hype? Whatever the case, u maybe making a huge mistake, like most other hollywood celebs. Be smart; get a prenup bec. this probably will blow up in a short manner of time. God speed!